Last week BBC Look East ran a news story about a cyclist being knocked from his bike by an inattentive driver but did not mention any police action being taken. Instead, BBC TV reporter Kim Riley read out viewer comments which complained that cyclists “do not pay road tax”. This factual error was not flagged as such by the BBC and nor was another comment about roads being funded only by motorists flagged as wrong. I put the offending clip on YouTube and it quickly went viral, with 6000+ views in just a few days. BBC Look East was deluged with complaints, leading to a follow-up story on Monday night’s show. This report majored on the abolition of ‘road tax’ in 1937. This is a fact rarely, if ever, reported in the mainstream media. 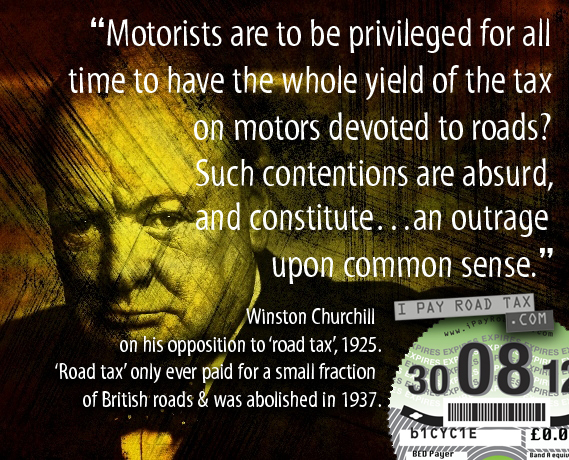 Kim Riley also featured the fact roads are funded by general taxation, an important point. Many motorists assume they, and they alone, pay for roads so, goes the flawed argument, cyclists have less rights to ride on those roads. He read out four comments, including two from doctors. Dr Tony Raven said he was “appalled by the standard of reporting,” said Riley. “None of [those who commented] will be nominating me for journalist of the year,” joked Riley. The BBC backtracking was relatively light-hearted aiming to dampen down the debate which, at times, can get heated. The story follows on from earlier successes by the iPayRoadTax campaign. Last month both Which?Car magazine and the Plain English Campaign agreed to use the more accurate ‘car tax’ when referring to Vehicle Excise Duty. This entry was posted on Tuesday, May 25th, 2010 at 4:21 am	and is filed under BBC Look East ignorance. You can follow any responses to this entry through the RSS 2.0 feed.